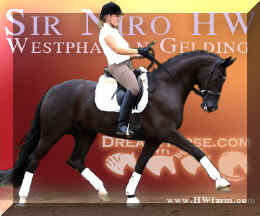 Sir Niro HW, dark bay Westphalian gelding, by Sir Donnerhall/De Niro, born in 2011, standing approximately 167 cm or 16.1 hands. Sir Niro is by Sir Donnerhall. Exclusive Young Horse National Champion and Reserve World Champion Producer of the Reserve Approval Champion and premium stallions as well as highly demanded foals Sir Donnerhall is the sire of World Champions, Bundeschampions, top prices and licensing winners. In 2013, Sir Donnerhall dominated the Bundeschampionships as no sire has before: His daughter Cindy OLD won the class for four year old mares and gelding and the licensed sons, Sir Henry and Sean Connery became Vice Champions of the five- and six-year old dressage horses respectively. Sir Diamond won the bronze medal in the class for five-year-olds and with Secret Love and Simply Red, two more of his descendants, reached the final. The son Sa Coeur was the 2012 and 2013 World Champion for five- and six- year old dressage horses and then the top price at the PSI-Auction in Ankum. Sir Donnerhall I has been popular as a sire of auction horses for years and he regularly delivers top horses selling for six-figure prices. For years the FN's breeding value estimation declares Sir Donnerhall I, who is trained up to Grand Prix, as one of the best dressage horse sires. He himself was second Reserve Champion at his licensing, in 2005 I-a main premium stallion, in 2006 Bundeschampion as well as Vice World Champion for five-year old dressage horses and has turned out to be a trademark stallion: He has already produced 85 licensed sons, including the NRW Champion Stallion and Vice Bundeschampion, Silbermond, the Southern German Champion Stallions Sir Nymphenburg I and Sir Schiwago as well as numerous premium stallions at all the German licensing sites. More than 60 daughters have been awarded the state premium. His daughter Assandra was nominated as Austria's best three-year old mare. Sir Donnerhall: One of the most reliable German dressage horse makers. Sir Niro HW's dam is by De Niro. She is a Statespremium mare with an overall score of 8.01, called "Die Dame". De Niro's sire, Donnerhall, holds the highest dressage breeding value index (271) of all stallions. He placed second among 70 stallions at his performance test and went on to become DLG Champion in 1986. Donnerhall won more than 65 FEI Level and Grand Prix competitions and competed successfully until he was retired at 17-years of age. 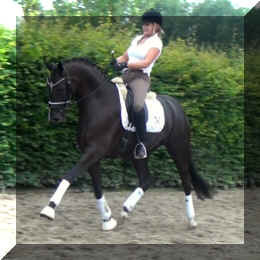 De Niro's dam was a successful dressage competitor producing an Approved stallion in Westfalia. His dam's sire, Akzent II, is regarded as one of the best sires of rideability in modern sport horse breeding producing many Approved stallions and expensive auction horses. In 1997, De Niro was vice champion of the stallion performance test in Adelheidsdorf with a score of 141.93 points and champion of rideability with a score of 145.41 points. 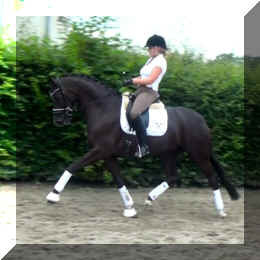 In 2000, he won Grand Prix dressage tests at the age of seven. In 2001, he won the German Championships of Professional Riders with his rider Dolf-Dietram Keller. 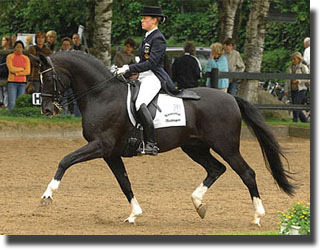 In 2002, he won international Grand Prix and Grand Prix Special dressage tests in Saumur and Berlin. 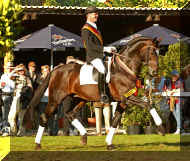 In 2003, he was the winner of the German Dressage Derby in Hamburg. In 2004, De Niro provided the champion stallion Dancier at the licensing in Verden, following two vice champions in previous years. In 2005, De Niro was dam sire of the champion stallion in Verden. In 2006, with 14 descendants at the German Young Horses Championships, De Niro provided the largest contingent. In 2007, De Niro’s son Deveraux became World Champion of the six-year-old dressage horses in Verden. Several of De Niro’s offspring have been victorious in Grand Prix dressage competitions. In 2008, De Niro was honoured by the Hanoverian Society with the title “Stallion of the Year”. In 2009, De Niro provided two European champions as well as Dablino, the most successful Grand Prix newcomer. In 2010, De Niro was awarded place five of the World Breeding Federation for Sporthorses with 10 internationally successful offspring at Grand Prix-level. His son Dablino won the Team Bronze Medal with rider Anabel Balkenhol in Kentucky at the world championships. Desperados by De Niro and his rider Falk Rosenbauer won the German Dressage Derby in Hamburg. In 2011, the descendants of De Niro won a total amount of more than 230,000 Euros. The overall amount of prize value of his descendants reached more than 1,000,000 Euros. In 2012, De Niro is ranked first in the ranking of the World Breeding Federation for Sports Horses. Therefore he is the best dressage stallion of the world. 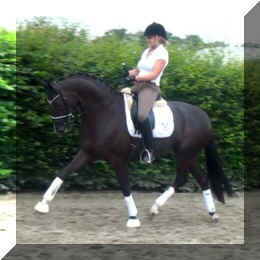 In 2013, De Niro confirmed his status as best dressage stallion of the world. The German dressage team with Desperados and D‘Agostino won the Gold Medal at the European Championships in Herning. The stallion by De Niro – Rosario, bred by Josef Greten, became champion stallion of the licensing in Oldenburg and was sold for sensational 910,000 Euros to the Danish Olympic rider Andreas Helgstrand. Sir Niro HW is a noble and elegant young gentleman. Sir Niro HW shows typical De Niro attributes, looks, movement, brains, temperament, he's the total package. He's truly coming after his dam sire. He will catch your attention with his beauty and elegance. He is a true eye candy, smart and willing to please. He has three very good, solid basic gaits and is super balanced and a willing worker bee. With his buoyant expression, everybody will remember him. 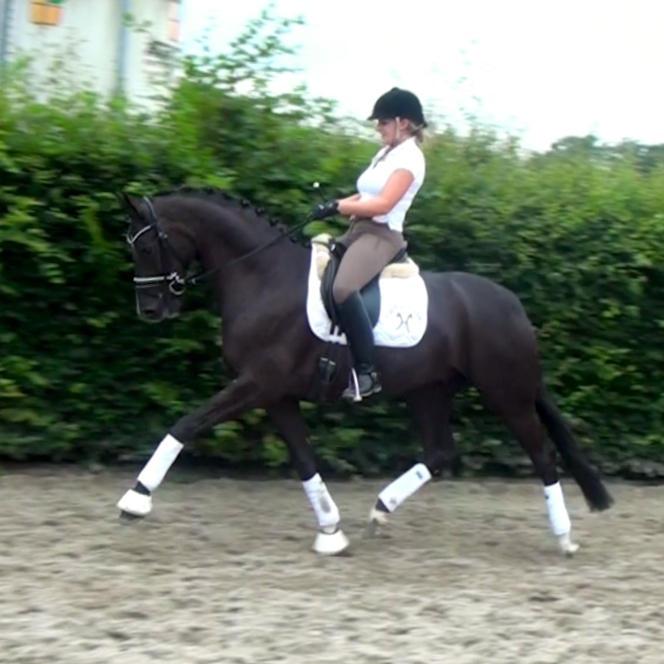 He is is ready to impresses with his stunning, uphill canter, his trot swings nicely through his body with a soft back and an active hind leg as well as a free shoulder. His walk is always rhythmic, no matter if collected or extended walk. Everybody will love this one, the judges and the audience alike will be excited to see him. He is a horse willing to learn daily, very sweet and with his super work ethic and attitude, a horse that fascinates his rider every day of the year. He is so much fun, safe and reliable. Even kids bring him out to and back in from the pasture in Germany, a young horse, with a very big heart and an old soul. He's looking for his life partner to go out, have fun and compete. He is uncomplicated on the ground and under saddle. He's just a sweetheart. 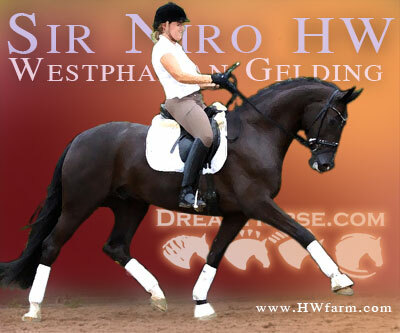 Sir Niro HW is suitable for an amateur, young rider, lady or professional alike to continue his training and go on from here. He is easy all around and behaves like a much older horse. He gets along well with other horses and loves human attention. He is very level headed. He wants to be in your pockets all the time and thrives for his personal grooming time and is on the lookout for cookies and carrots, oh - and apples! Loads and bathes, goes in the hot walker and is pleasant all around as well as a super partner. He is ready to go to his new owner and impress with his looks and potential for the upper level. This boy will go his way up the levels with ease and fun, hopefully you will be the one guiding him there and getting all the nice compliments. He is sweet, cuddly and has the quality stars are made of as well as a super pedigree, what more could you ask for? He is the partner you were looking for all along! He will enable you to fulfill your goals with all his abilities and athleticism. The main interest of HW Farm is, to find highly talented young horses in Germany for riders in the USA and all over the world. This is one phenomenal horse to remember, one that "has it all", buy him now and take him out to shows and clinics, he is ready for you. This one is a lover!